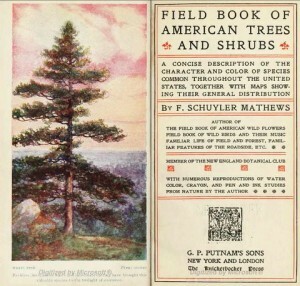 The full title of this book is, “Field Book Of American Trees And Shrubs: A Concise Description Of The Character And Color Of Species Common Throughout The United States, Together With Maps Showing Their General Distribution.” I guess they were into long titles in 1915! Woodworkers and luthiers could not do what they do without tress. This book had beautiful drawings, painting and information about many species of trees including some that might now be scarce or gone. This book in brought to you as a free PDF for download at the always wonderful Internet Archive. There’s nothing like a good tree book, except a free tree book. Thanks for the link to the Internet Archive. Two of my favorite tree books are a Natural History of Western Trees, and A Natural History of Trees of Eastern and Central North America. Both of them were written by Donald Culross Peattie, and I haven’t found any books as extensive or as interesting. The first copyrights are 1948 and 1950 with the last copyright in 1991. They are both available on Amazon used. For $15 dollars each you will have over 1300 pages of great tree history, and they’re worth every penny. @John, Thanks for the recommendation. I’ll take a look at those books! Knowledge has three degrees: opinion, science, illumination. The means our instrument of the first is sense; of the second, dialectic; of the third, intuition.